Expedited Delivery 3-5 days, product available in the United States Only. This Bassinet comes complete with everything your baby needs for the first few months of sleep. Classic, cozy, and comfortable, it features crisp bedding with a floor-length pleated skirt, finished off with a wide ribbon belt tied into a big bow. Generously sized, adjustable canopy completes they stylish look. The hooded, locking caster wheels can be flipped up to rock the bassinet like a cradle! Convert the bassinet to the cradle position easily - no tools needed. Mesh storage basket beneath the bassinet is handy for feeding and diaper changing necessities and toys. Canopy is easily folded down out of the way to tend to your precious bundle inside. Complete bedding set (hood, fitted sheet, and quilted liner/skirt) and foam pad included. White, metal bassinet frame assembles quickly without tools and the bedding is easily attached (and easily unzipped and detached for washing). The long, flowing skirt conceals the mesh storage basket and hides the bassinet stand. White, fitted sheet covers the custom fitted, vinyl-covered-foam pad. Bedding fabric is 100% Polyester. Bassinet is made with powder coated steel metal tubing, PP and ABS plastic, nylon, engineered wood, and PEVA (non-PVC) vinyl, and polyurethane foam. Overall unit (with hood up): 33 inches L x 17 inches W x 41.5 inches H with the wheels down (39 inches with the wheels flipped up in rocking cradle position). Height from the rim of the bassinet to the floor: 28.5 inches H with the wheels down and 26 inches H with the wheels up. Canopy height when fully open: 13 inches H. Base of bassinet (below where baby sleeps): 25.5 inches L x 17 inches W x 19 inches H with the wheels down (16.5 inches H with the wheels flipped up in rocking cradle position). Interior of bassinet measures 32 inches L x 15 inches W x 8.5 inches deep. 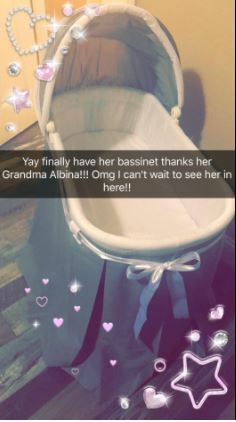 Foam pad: 32 inches L x 15 inches W x 1 inch H. Mesh storage basket: 18 inches L x 10.5 inches W x 4.5 inches H. There is about 5.5 inches of clearance between top of basket and bottom of bassinet. Assembled product weight: 12.1 pounds. All measurements approximate. All bedding is machine washable (in cold water and gentle cycle). Tumble dry low heat. Iron on low setting no steam if needed. Adult assembly required. No tools needed for assembly. Illustrated instructions included. Bassinet is for use up to 20 lbs. (9.09 kg), 3-4 months, or until Baby can push up, roll over, or sit unassisted (whichever age, weight, or activity limit comes first). In order to comply with current safety standards, the mattress does not exceed 1 inch in thickness. Mesh basket is designed for lightweight items (up to 5 pounds total). Product complies with all currently applicable U.S. safety standards. Product includes a limited warranty of 30 Days Parts to the original purchaser. Product details/features subject to change at any time without notice. Props/accessories shown are for illustration purposes only and are not included with the product. Actual color/finish may vary slightly from screen display. This item ships in its original carton which may include a product photo. Additional white polyester/cotton sheets sold separately in packages of two (Model #31003). No baby yet so my review is more about how it looks. So far I love it!! It looks beautiful and can't wait to have my baby in there! Since she is not born yet I can review for the actual use of it but view wise and feel is nice! I love how it looks and it was fast and easy assembly! The basket under is pretty small to store stuff so that's the only thing I was like eehh. But overall I really liked it! The mattress is thin so I'll add blankets to soften the bed.